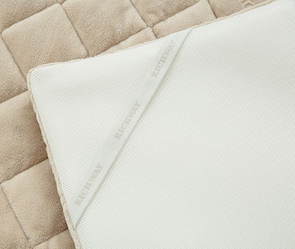 The Richway Quantum Energy Pad is a new innovation from Richway International, made not only to add healing potential to your Biomat experience, but also to add comfort. The plush, soft Quantum Energy Pad uses quantum energy produced by 18 special substances extracted from peach pits and grape seeds to provide another dimension of healing while you are using your Biomat while adding padding that will make your Biomat more comfortable. Quantum energy normalizes cell function, which in turn allows for better detoxification, increased blood circulation and a more focused mind. Quantum Energy Pads come in the same sizes as Biomats -- King, Queen, Single and Professional -- and fit onto your Biomat adding a layer of cushioned comfort. More importantly, they add another dimesion of healing. Quantum Energy Pads produce quantum energy, which is a negative energy. Cells thrive on negative energy. Negative energy revitalizes cells in the human body by stabilizing them which makes them more efficient at expelling wastes and toxins, which in turn helps the body detoxify faster, increasing blood circulation and your immunity to disease and sickness. When a cell is in pain, it shows a spike in positive energy. Introducing quantum energy to the cell strengthens the cell membrane and stops the pain signal.